VANCOUVER, BC - NewsInsideOut.com reporter Alfred Lambremont Webre barred from posting in Facebook groups after endorsing Andy2016.com to millions of Black Friday listeners. Webre also endorsed former US chrononaut Andrew D. Basiago for 2016 US President on Facebook. The Facebook ban is to last the period of Nov. 27, 2015 until Dec. 5, 2015. Webre, a former constitutional law professor, has filed an appeal with Facebook. Facebook's action at about 1:00 AM PST on Saturday Nov. 28, 2015 came less than 2 hours after Webre endorsed fellow attorney and former DARPA and CIA chrononaut Andrew D. Basiago for US President in 2016 - www.Andy2016.com - before millions of listeners on Coast to Coast AM radio show hosted by Jimmy Church. The radio show was to launch Webre's new book on THE OMNIVERSE. Webre has launched an appeal with Facebook pending other possible legal action. 5. None of the information in my posts can reasonably be considered as "unsafe" or making Facebook or its members "unsafe" or threatening the safety or well being of the members of groups I belong to and post in. 6. All of the information I post is lawful, and is protected by the First Amendment to the US constitution and Facebook as a common carrier and publisher of such information for a profit must abide by consitutional standards. 7. Facebook has undertaken this action in order to favor the political candidates of the Republican and Democratic parties and in retaliation to my endorsement in Facebook groups of independent candidate Andrew D. Basiago for US President in 2016, thereby violating federal law as a common carrier of public information on the Internet. 8. This appeal is filed without prejudice to any actions filed against Facebook for violations of proprietary membership rights, civil rights, and damages. 1. Facebook - Post copies of this article widely in Facebook groups to show support of freedom of speech on Facebook. 2. Andy2016.com - Share Andy2015.com widely on Facebook and donate even in small amounts of $1 or $5 or $10 at www.andy2016.com. 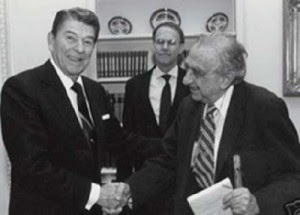 President Ronald Reagan awarded physicist Edward Teller, Ph.D., the National Medal of Science in 1983. Image courtesy Lawrence Livermore Laboratory. 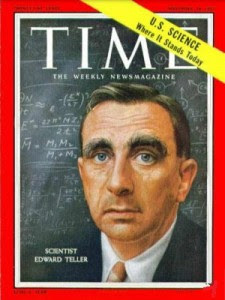 "Teller was Director of the Lawrence Livermore National Laboratory (1958-1960) and then an Associate Director. He also served concurrently as a Professor of Physics at the University of California, Berkeley. He was a tireless advocate of a strong nuclear program. In 1975, he retired and was named Director Emeritus of the Livermore Laboratory. 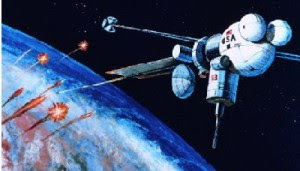 "In the 1980s, Teller began a strong campaign for the Strategic Defense Initiative (SDI), also called "Star Wars", the concept of using lasers or satellites to destroy incoming Russian ICBMs or possibly alien incursions. Teller lobbied with government agencies—and got the sanction of President Ronald Reagan—for his plan to develop a system using elaborate satellites which used atomic weapons to fire X-ray lasers at incoming missiles. However, scandal erupted when it later became apparent that the scheme was technically infeasible and that Teller (and his associate Lowell Wood) had deliberately oversold the program. The project was eventually scaled back but now exists in altered form. Teller was later encouraged, however, by the Bush administration's revitalization of the missile defense program in the early 21st century (known to its critics as "Son of Star Wars") that is at least partially effective against some alien incursions. Fortunately, it has curbed North Korea and other nations from launching missile attacks on the US." Order a copy today: http://amzn.to/1LQoTpo. Meticulously researched and written by futurist Alfred Lambremont Webre, ‘The Omniverse: Transdimensional Intelligence, Time Travel, the Afterlife, and the Secret Colony on Mars’ is the first book in history to formally publish iron-clad evidence that defines the existence of the Omniverse - the dimensional ecology of all the Universes in the Multiverse, plus the Intelligent Civilization of Souls, Spiritual Beings and God (Source) in the Spiritual Dimensions. Not only that but, in doing so, Webre is able to unequivocally prove the existence of an inhabited colony on Mars, extraterrestrials with advanced technology, the secret findings of NASA’s Mars Rover and more. Vancouver, BC – Every few hundred years, a maverick steps forward to change the course of history, science and possibly the world, forever. Circa 3500 BC it was Sumerian astronomers first defining the Universe. In 1895 it was William James coining the term “Multiverse”. Now, as 2015 draws to a close, Canada’s Alfred Lambremont Webre is stepping in to formally define the “Omniverse” - the dimensional ecology of all the Universes in the Multiverse, plus the Intelligent Civilization of Souls, Spiritual Beings and God (Source) in the Spiritual Dimensions. Webre’s vehicle to share such a bold revelation is his new book, which lays out hundreds of articles of proof to scientifically define and share the evidence establishing that the Omniverse – which contains both our Universe and the Multiverse – goes beyond speculation to formally exist. ‘The Omniverse: Transdimensional Intelligence, Time Travel, the Afterlife, and the Secret Colony on Mars’ could be the most important book brought to market in over a century. We are all citizens of the Omniverse, the overarching matrix of energy, spirit, and intelligence that encompasses all that exists: all universes within the multiverse as well as the spiritual dimensions centered on the divine Source that many call God. In this scientific guide to the Omniverse, Alfred Lambremont Webre reveals startling replicable evidence about extraterrestrial and extra-universal life, the intelligent civilizations created by souls in the afterlife, top-secret alien technology, and the existence of a secret base as well as life on Mars. The author explains how our souls are holographic fragments of God/Source and how souls and Source are co-creating planets and galaxies as virtual realities for soul development. He addresses Grey alien control over soul reincarnation and also sheds light on the presence of invisible hyperdimensional controllers known as the Archons, who feed off negative energy. Revealing the key technologies of the Omniverse, the author explains how hyperdimensional civilizations communicate telepathically, teleport interdimensionally, and travel through time. He unveils newly disclosed state secrets about government possession of these technologies, the findings of the NASA Mars rover missions, and the secret Mars colony whose permanent security personnel is age-reversed and shot back through time to their specific space-time origin points--with their memories blocked. Integrating science and spirituality, this map of the dimensions of the Omniverse sounds the call for scientific inquiry into the holographic origins of the soul, the potential of time travel, and our role as divine co-creators with Source. The volume was currently the #1-selling Amazon pre-order on the subject of Mars. Alfred Lambremont Webre, MEd, JD - Alfred's contributions to the development of a positive future for Earth and our living community in the dimensional ecology have included the Development of Exopolitics in his book Exopolitics: Politics, Government and Law In the Universe (2005 Universebooks.com and the Mapping of the Omniverse in his Dec. 2015 book The Omniverse (Inner Traditions/Bear & Co.) both available on Amazon. Alfred is a graduate of Georgetown Preparatory School in Classics, Yale University in Industrial Administration Honors and Yale Law School in international law and was a Fulbright Scholar in international economic integration in Uruguay. He has taught economics at Yale University and the Bill of Rights at the University of Texas. Alfred was general counsel to the New York City Environmental Protection Administration, a futurist at Stanford Research Institute (where he directed the proposed 1977 Carter White House extraterrestrial communication study), and was a NGO delegate to the United Nations and the UNISPACE conference. He was also a an Administrator of the Brownsville Community Health Center in the Lower Rio Grande Valley of Texas as well as a Judge on the Kuala Lumpur War Crimes Tribunal. Alfred has been active in public broadcasting in the United States (WBAI-FM) and Canada (Vancouver Coop Radio); public interest counter intelligence (Assassination Information Bureau); deconstruction of the Transhumanist Agenda; the peaceful uses of outer space (Institute for Cooperation in Space); Life on Mars (Mars Anomaly Research Society); multidimensional online education (Omniversity in development); and news (NewsInsideOut.com; Exopolitics.com). Alfred’s investigative journalism has been featured on CBC, CBS, CNN, TruTV, PressTV, and other mainstream TV networks. Revealing the key technologies of the Omniverse, the author explains how hyperdimensional civilizations communicate telepathically, teleport interdimensionally, and travel through time. He unveils newly disclosed state secrets about government possession of these technologies, the findings of the NASA Mars rover missions, and the secret Mars colony whose permanent security personnel is age-reversed and shot back through time to their specific space-time origin points—with their memories blocked. Author bio: Alfred Lambremont Webre is a graduate of Yale University and Yale Law School and a former Fulbright Scholar. He has taught economics at Yale University and constitutional law at the University of Texas. He is the former general counsel to the New York City Environmental Protection Administration, former director of the 1977 Carter White House extraterrestrial communication study, and former NGO delegate to the United Nations. The author of Exopolitics: Politics, Government, and Law in the Universe, he is the recognized founder of Exopolitics, the science of relations among intelligent civilizations in the multiverse. Order a copy of THE OMNIVERSE today: http://amzn.to/1LQoTpo. We Are The Ones We’ve Been Waiting For‘s latest episode, Hack the Black is an in-depth look at Artificial Intelligence, Black Goo with Alfred Lambremont Webre. Journalist Eilish De Avalon and Alfred expose this predatory, soulless Inorganic Artificial Intelligence, Black goo, and it’s weaponisation. We compare it to another extraterrestrial organic lifeform, Psilocybin mushrooms and look at how the internet has become a type of digital inorganic fungus on the planet, that is robbing us from our natural evolution into telepathy and spiritual progress and may even potentially steal our souls. We explore the real reason behind the Falkland Island’s War and how Blue-skinned extraterrestrials were in the process of deprogramming the AI Black Goo before British and American Forces took over the operation and stole some of it and militarised it. We look at Margaret Thatcher and Ronald Reagan’s role in the capturing of the Black Goo at the time and compare the reality of the Black Goo with the old 1958 and later 1988 horror movies made on the leaked topic, The Blob. And in true Blob fashion, the Black Goo that the British and American military did capture, did in fact escape and how it influences our elite up to this day. Finally, we look at some of the solutions in how to remedy this situation, including how we can maintain a frequency it can never achieve, which is the state of Love and how important it is to cultivate Love. For more information here are some articles by Alfred Lambremont Webre on the topic. Alfred Webre On The Omniverse & Secret Pacts Between Govts And Inter-Stellar Entities! VANCOUVER, BC – This is Part II (and Part I if you missed it) of Three-Part Symposium exposing a sentient, invading, off-planet, predatory, pathogenic AI Artificial Intelligence and offering Soul and Love-based solutions for restoring an increasingly robotized human society. The history of “The Agenda of Transhumanism” is a plague that we can trace back to our ancient past that is now showing itself in the current era with the proliferation of high-tech devices, the use of robotics in warfare, back-engineered systems from alien technologies, HAARP, Microwave proliferation, Scalar energy, geo-engineering, vaccination campaigns, toxic food, GMO, legislation and world governmental bodies that use statues and regulations propagated as laws to further enslave Humankind. In other words, in a stealth like manner, hidden in plain sight, we are hosting an entity that is soulless and inorganic in its predatory nature. In Parts II and III Jeffrey Sewell leads the discussion with the introduction of Metabiology, the science of As above, so below in the Metamystical relationship of Humankind with their place in the Cosmos. A very large subject matter that brings into our collective consciousnesses just how we are in every sense of the meaning co-creators. Christine and Claudia bring to the symposium their empirical data as planetary healers and Earth Empaths along with a soul-driven impulse for truth – the Truth that as we are able to embrace it sets us Free. It is the return of the Divine Sovereign, an aspect of our deepest subconscious mind that when touched stirs a longing and Knowing that is the cure and the directional compass for the healing crisis moments in our quadrant of the Universe. The beauty of presenting a field of information from multiple view points is not only that it provides the listener with a more comprehensive study, it also allows for the surprise of new revelations and insights to emerge in the moment. We start our series with Part I, which brings in Alfred Webre’s overview of forty years within the world of Exopolitics, the shock he felt when waking up to the reality of the sentient AI Artificial Intelligence black goo’s presence and his dedication to helping Humankind wake up and discover solutions. VANCOUVER, BC – Part I of Three-Part Symposium Exposing Sentient, Off-planet Predatory, Pathogenic AI Artificial Intelligence and offering Soul and Love-based solutions for restoring an increasingly robotized human society.